Buying a kitchen is no different than choosing your mate partner. At the beginning you researcher, get informed, listen opinions. You find examples you like, and make a list of desirable features. As a designer, you can get frustrated when client comes with a picture of sister's kitchen saying : "this is what I want" instead giving a chance to your creativity. Why do people imitate? 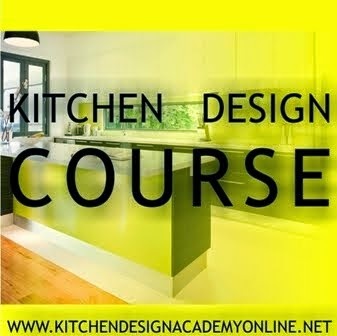 “I believe a great kitchen has a magic to it that transforms the physical room into a feeling. People are drawn to that kitchen, and they may not know why. The kitchen sings. It is my job to write the music. I may call myself a kitchen designer, but what I really do is orchestrate and conduct the dreaming process. For over forty years, enthusiasm, dedication and determination have been the driving forces behind Cesar’s business activity. The company was founded in 1969 in Pramaggiore, near Venice, and has gradually grown and evolved into the current, internationally-renowned concern. The secret behind this success is Cesar’s passion for quality, design and research. In other words, for customer satisfaction. A functional and lively model. Doors and open units available in different sizes and finishes revolutionise the usual repetitive sequence of identical modules. It is put together like a puzzle and meets modern living requirements in a self-assured and lively way. Kora upholds a carefree lifestyle that doesn’t detract from an eyecatching and distinctive look. Yara transmits a feeling of great solidity thanks to its impressive volumes, minimalist lines and very thick, 2.5 cm doors. This is a kitchen for those who love the synthesis of contemporary design set off by precious finishes. A project that aims straight at the heart and becomes the emotional hub of the home. The kitchen is the room in the home where harmony reigns, where tradition is exalted and tales of old are told. Elite represents the essence of this room: its reassuring atmosphere, emphasised by its elegant forms, stimulates strong emotions and acknowledges it as a place where people meet and enjoy the pleasures of the table. Head of Group Design at Electrolux and head of jury Lars Erikson comments on the submissions. "Hello! I'm An Artist, Passionate About Product Design. My Dream Is To Create Concepts That Will Make Our Lives More Pleasing And Comfortable. I Very Much Love To Dance And Sing - It Completes My Well Being." What is the concept LIO? LIO is a natural and symbiotic experience which cleans air by using purifying living microorganisms in it’s filter. The living microorganisms consume carbon molecules and thus purify the air in home environments. The concept provides fresh clean air into the interior space, as well as eliminates unpleasant odors and gives information about the air we breathe in it’s stylish glass surface. The living air wall allows the consumer to intuitively control the inside air conditions in different rooms according to different needs. "During An Exchange Minor In New Zealand I Wanted To Be A Participant Of The Electrolux Design Competition. Due My Enthousiasm, Visualisation Skills And Broad Knowledge I'm Able To Bring A Project To A Success!" What is the concept Surphase? Surphase is a multi-purpose cooking appliance that can be used to heat and cook or even to cool food. Thanks to it’s flexible form, the cooking process can be done either on a flat surface like on a hob, or bent to cover a pot and be used as an oven, or even grill your steak by wrapping the surface around the steak. The broad usage of Surface will encourage people to prepare their own food either at home or by bringing the appliance along to a trip. "I Am A Product Designer Who Has Interests In Digital Art And Photography And Loves To Discover New Cultures. In Terms Of Design Understanding, Believe In Power Of Pure, Detailed Design. I Am A MSc Candidate At Coventry University"
What is the concept Fabric Assistances? Fabric Assistances lets you refresh and iron your clothes in a matter of minutes. It steams clothes with water and deodorising cleaning fluid and automatically goes across the entire surface of the garment until it’s clean or until it’s manually stopped. By scanning the fabric care label on each garment, Fabric Assistances makes sure to always give it the right treatment. 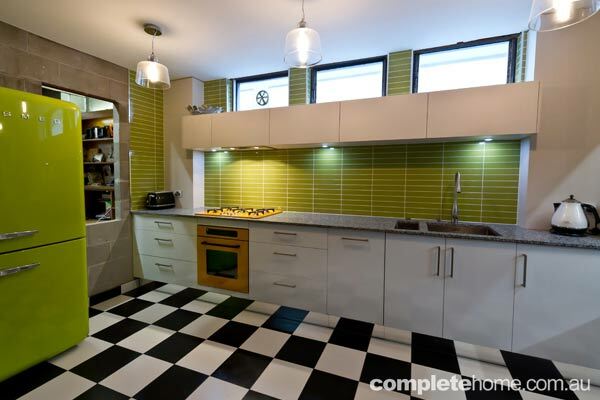 With pops of bright colour and retro influences, this trendy kitchen by Mint Kitchen Group is anything but ordinary. This kitchen can be found in a 1970s townhouse in Melbourne’s inner suburbs, with two storeys and a flat tin roof. The house itself was non-descript and lacking in character, so the owners wanted to bring some colour and warmth into the space. “The client wanted something special, something different, something trendy. He required a functional, usable space that worked well within the limitations of the space for a young family,” Albert explains. Everything else about this space is bright, funky and unique. 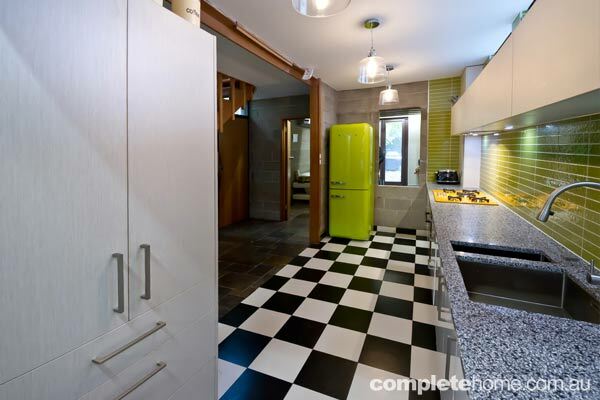 From the kiwi-coloured glass splashback tiles to the lime tones of the fridge and the yellow oven and cooktop, this is a kitchen that really stands out. 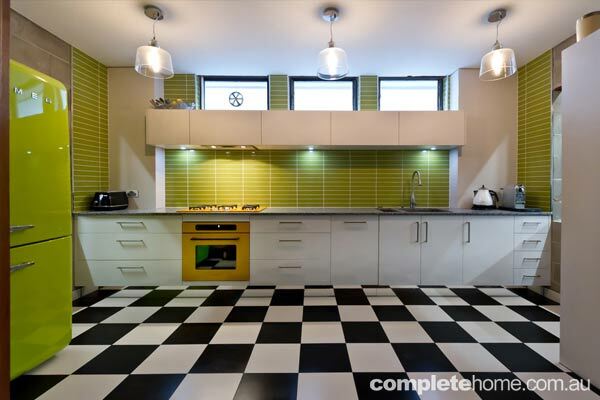 The über-cool chequered floor completes the retro look. Looks aside, this kitchen is also highly functional for everyday use. It’s spacious and has plenty of storage and all the latest internal hardware and appliances to make the space as practical as possible. In a time when so many kitchens seem to have been cut from the same mould, this innovative and fresh space really stands out from the crowd. The Oblong Bar Cabinet is a fusion of modernistic and classical elements into a highly detailed and exquisite limited edition furniture piece. The modern cabinet was specifically designed to act as a statement piece in contemporary living rooms and raise the bar on luxury decoration. 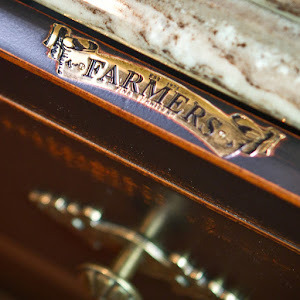 Handcrafted by our finest craftsmen, the luxury cabinet was born from the use of production methods developed to deliver the highest quality. Inspired by the old photos frames, will bring to your house classical and modern touch.